What I've learned since I graduated. As of this writing, it’s been just about six months since my degree was awarded. I handed in my last coursework at the end of August 2014, and did some nail-biting while my thesis was graded. But I didn’t actually see my physical degree, framed and signed and in all its majesty, until last week, when I went home for Easter! It was surprisingly affecting — I didn’t think seeing my name all gussied up like that was going to be such a gut-punch of emotion, but I am really proud of that big piece of paper. There is no time for a break, no time to kick back and separate yourself from the field once you hand in your last assignments. Chances are you’ve got a job offer lined up, unfinished research projects, a handful of applications to send out, a move, some volunteer commitments or conferences, or some other thing that should be occupying your time. But you should prioritize a few hours (ideally with wine) to assess your situation, yourself, and your goals: what gaps are left in your education that will stand between you and your dream jobs? What experience do you lack based on the job postings you’re seeing? What’s the most likely progression going to be for you, from entry-level onwards? How can you prepare for each of those steps? One of the best little tricks is to go back and read the term papers and assignment you handed in in your first semester. Does it make you cringe now to see how naive you were? Alternatively, aren’t you impressed with how far you’ve come in such a short time? Are you happy with all the listservs and newsfeeds you belong to? Could you stand to add more, or lose a few of the less-relevant options? 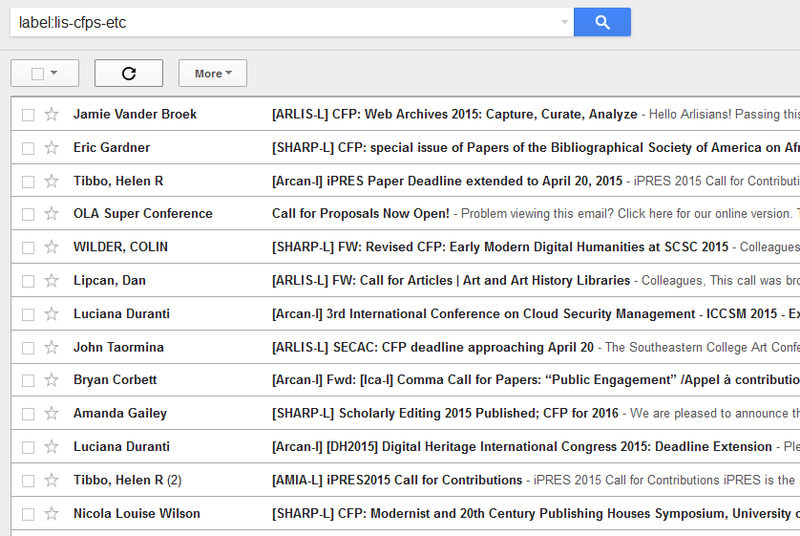 Personally, my feed for information on the profession comes from a couple of Canadian archiving lists, ARLIS, AMIA, SHARP, MCN, and the ALCTS eForum I mentioned previously. I’ve pared down a bit, and there are a few lists I’d like to be on for which I can’t afford a membership. AMIA, for example, is a fantastic way just to keep in mind all the weird format issues and preservation challenges that multimedia workers face every day — there are always emails about finding a specific fitting for a rare tape player, or how best to clean a certain type of film with flourescent dye on it. If you’re bad at mechanical terminology, I guarantee you’ll pick it up quickly. I use the Art News mailing that comes via CARLIS-L to remind me to check websites like Artforum and Canadian Art. Otherwise I tend to forget. I can’t afford individual journal subscriptions, and I don’t have institutional access to that stuff, but I do read up on accessible (OA, PD) things when they go by in my feed. I only splurge on one physical publication, and that’s Cabinet Magazine, which doesn’t keep me up-to-date so much as inspire me regularly on all fronts. On WordPress I follow things like Archives Gig, SNAP RT, most of the ARLIS SIGs’ and Sections’ blogs, and a few oddballs like Artist-Driven Archives and Failure in the Archives. I’m sure someone will tell me that I should consolidate or aggregate a bit better, but, nah. On top of the full-time job, I’ve got a few guest posts and articles queued up for publishing, two regular volunteer commitments (ArLiSNAP, and a journal I help copyedit) and some irregular ones (peer-reviewing for two journals), an ongoing data-mining project with a non-profit here in Toronto (no funding, just fun! ), writing for ArLiSNAP and my own blog, and maintaining a Twitter presence of questionable quality. I’ve done two conferences so far this year, and have two more to come (both speaking engagements, one of which is reporting on a yearly survey I run using Google Forms). This weekend I decided to start a project to improve listings of library and archives associations in Canada (probably with the goal of making Wikipedia pages for each). I have at least four copyright-related tumblrs I’d like to start. Now that I’m thinking of it, I volunteered to copyedit a new book by CARLIS, which I should be hearing about any day now …. 4. Forget about everything I did in school. No offense to my alma mater, but I didn’t leave school with a huge network of trusted peers and great professors (or respect for government funding for higher-ed, or ALA accreditation, or …). There was little critical education in the classes I took, which is understandable given the breadth of what has to be taught, but it meant I didn’t find people who thought and argued like I do. Being thrown into a room with people doesn’t guarantee you’ll find things to talk about — and the #1 thing I’ve learned since graduating is that there is a huge variance of why people got into this profession, and what it is they want to accomplish within it. I moved away from Montreal when graduation was in sight, so I may have shot myself in the foot a little there (also I’m not on Facebook and am only a recent convert to Twitter), but I’ve managed to network so much better back in Toronto, without many ties to the people I spent a year and a half interacting with. A lot of it is online, through associations and listservs and volunteer work with eventual face-to-face meetings at conferences — and a lot of it is engaging people on social media once I’ve come to know and respect their work. I think the best part of my MLIS was the four jobs I did during that time — one RA position, one job in the library, one internship for a design company, one summer contract with a non-profit — because it gave me at least some experience in a diversity of settings. While I am invested in the academic use of the degree, I wasn’t going to get a job without being able to articulate some proven skills and accomplishments. So, yeah, I recycled some term papers as applications for student awards, sure, but I don’t think my classwork and student chapter attendance are worth much now — and I’m sure they’re not all you have to offer the world, either. Which is why it’s good to …. 5. Stay smart about career moves.